Robin has raised a $7M Series A led by FirstMark Capital, joined by our existing investors Accomplice, Boldstart, Fundfire, Space Pirates, and Mike Germano. Amish Jani (partner at FirstMark) is joining our board of directors. It feels really good to share the news, but damn we’ve got a lot of work to do. At the beginning of 2014, we took our entire team from the agency we started previously, and set out to build a new company that tackled one idea: Companies tend to have limited data on how their workforce uses their workplace. Scheduling the most basic office resources is an unrefined art form for many companies, often breaking down into an “I was here first” free-for-all in conference rooms. And that doesn’t help people get work done. There is a disparity between how we expect home technology and office convenience to work, but why should it? We tend to tolerate more at work because we’re paid to be there, but offices should be a whole lot smarter, and help the people that are using them every day. And that’s how Robin came to be. We raised $2.9M in our seed round, from Accomplice, Deep Fork, Boldstart, Konica Minolta, Autodesk and some great angels. We set out to make scheduling conference rooms a heck of a lot easier. Fast forward to today, we’re doing this in thousands and thousands of conference rooms for folks like DraftKings, Netflix, Sonos, Blue Apron, and many more. 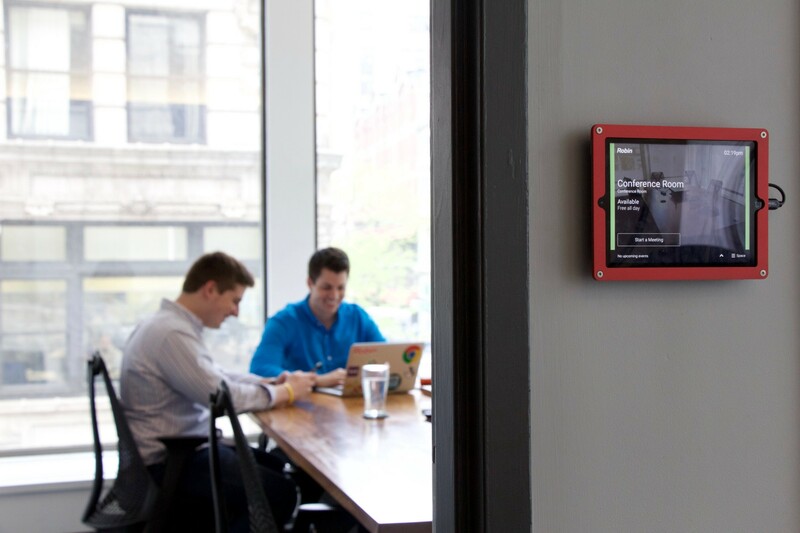 Room displays — iPad or Android tablets mounted outside conference rooms. Ties into existing calendars (Google, Office 365, Exchange). Web + mobile room booking — An office search for finding and booking the right room, with the right stuff, at the right time. Utilization reporting — See which rooms are popular, cancelled frequently, and the types of amenities are in hot demand. Beacons & real time occupancy sensing — Bluetooth beacons can be placed in a room, broadcast to nearby mobile devices, and automatically check users into meetings. Integrations! Slack, indoor wayfinding, mapping, & more — Robin integrates with Slack for an office chat bot, Aruba Meridian for turn by turn directions, and lots more to come. When it comes to growing even smarter, questions like What just happened? or What needs to happen next? are an inevitable future step. The workforce is becoming mobile and with that, gracefully coordinating office resources becomes even more important. Rooms shouldn’t require user manuals. The office will be smart. It will be a thoughtful concierge, helping to enable the workers that show up everyday with as little friction as possible. We’ve got the roster, the “can do” attitude, and the fuel we need to help make a dent in the workday — we intend to make it happen.